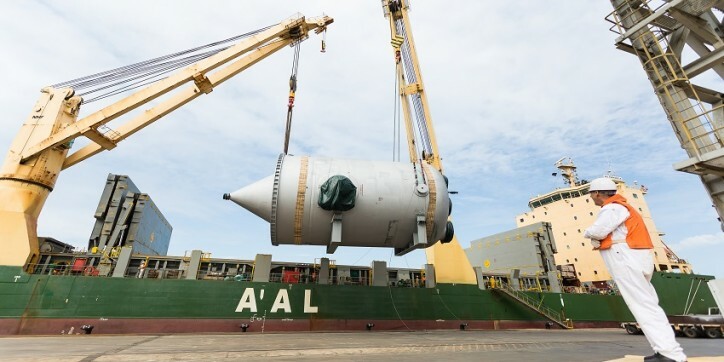 AAL has successfully completed the transportation of two giant ‘cyclone vessels’ (each measuring approx. 22m x 11m x 10m and weighing over 500mt) to Petronas’ US$27 billion RAPID project in Malaysia, on behalf of leading freight forwarder, Oceansmart Global. The two cyclone or ‘tertiary’ vessels were loaded onto the AAL Fremantle in Mailiao, Taiwan, using her combined 700mt cranes to safely lift and stow the cargo into one of her three giant, box-shaped holds and weather deck respectively. The units were discharged in Tanjung Setapa, ahead of their installation at Petronas’ refinery and petrochemical integrated development project (RAPID) in Pengerang, Southern Johor, Malaysia. The RAPID project covers an area of 2,000ha and, when fully operational in 2019, is expected to produce an estimated nine million tons of petroleum products and 4.5 million tons of petrochemicals a year.